A termites’ caste is based on the colony, meaning that the decision of if a termite will evolve into either a worker, soldier, or reproductive termite is based on the needs of the colony they belong to. Termites experience several phases during their life cycle. The cycle begins when a fertilized female lays eggs resembling caviar. A new queen will lay approximately two-dozen eggs in her first clutch and will continue laying eggs throughout her life span, which can last for over a decade in optimal conditions. Though eggs are the first stage in the termite life cycle, and of course important for the colony, their presence does not indicate an infestation. The eggs are large enough to be visible to the naked eye, but they are laid in sheltered conditions, such as in wall interiors or underground nests, making it hard for humans to readily spot them. Though the reproductive termites are not usually responsible for causing structural damage, it is crucial that worker termites be exterminated in order to eliminate the entire infestation. Newly hatched termites are often referred to as “larvae,” but they do not undergo a metamorphosis like flies do. These larvae typically hatch within a few weeks. Size-wise they are approximately the same as the eggs they hatched from. 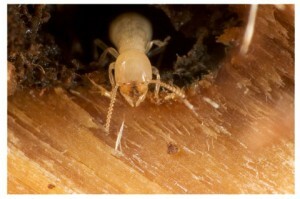 Worker termites tend to the newly hatched larvae. After the larval stage the termite will evolve into another caste – such as a worker, soldier, or reproductive.